In order to separate between eating milk and meat together, Chazal instituted certain procedures to solidify this distinction. 3.6 How Are Six Hours Calculated? In the Gemara Chulin 105a, Rav Chisda says it’s permitted to eat meat after cheese but forbidden to have cheese after meat. Mar Ukva relates that his father would wait a whole day after having eaten meat to eat cheese, while his practice is to wait from meal to meal. Rashi (Chullin 105a s.v. Asur) explains we’re more strict regarding meat because the taste from the meat and it’s fat stays in the mouth for a very long time. However, the Rambam (Maachalot Asurot 9:28) writes that the reason is that there’s a fear that meat is stuck between one’s teeth. The Tur YD 89:1 says that if one according to Rashi if one just chewed on meat (and didn’t swallow) one doesn’t have to wait because there’s not a strong taste when just chewing meat, if meat is found between one’s teeth after the allotted time one must remove the meat since it still has the taste of meat. However, according to the Rambam if one chewed on meat one must wait as there is a real concern of meat getting stuck in one’s teeth but if meat is found between one’s teeth after the allotted time one doesn’t have to remove it because the one only waited that time so that the meat between one’s teeth would become digested and lose the status of meat. The Tur 89:1 concludes that one should be strict for both opinions. This is the accepted ruling by the S”A 89:1, Shach 89:2, Biur HaGra 89:3, and Taz 89:1. The Pri Megadim (YD M”Z 89:1) writes that according to both reasons (taste of meat and meat stuck in teeth) if one only chewed on a cooked meat dish (not actual meat) one shouldn’t have to wait, however, it’s proper to wait. This is quoted by the Pitchei Teshuva 89:1 and Kaf HaChaim 89:3. Some Rishonim (Tosfot Chullin 104b quoting רבינו תם and Bahag) hold that there’s no minimum amount of time one only needs to wash one’s hands and wash out one’s mouth. The Baal HaMoer, Yerayim (Siman 149) and Raah (Bedek HaBayit pg 83) agree with this. Some Rishonim (Tosfot 105a) say that one shouldn’t have it the same meal but if one makes Bracha Achrona and then eat meat. The Mordechai quotes the Ravyah who agrees to this. The majority of Rishonim (Rosh and Rif) that it’s the time span between the morning and afternoon meal (because in those days they usually only ate two meals). Based on this, the Rambam writes that one must wait the time between one meal and another which is 6 hours. 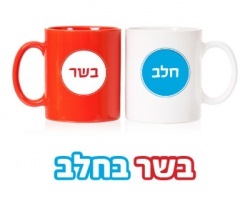 This is also the opinion of ריטב"א, מאירי, and Ran. This is codified in S”A YD 89:1. If one ate a a meat dish, parve food cooked with meat, one can eat a dairy dish. The minhag is to wash one's hands and mouth with a liquid and wash one's mouth with a food. However, some say that the minhag is also to wait six hours. Food that was cooked in a meat pot is considered parve and one doesn't need to wait 6 hours after eating it, though it can't be eaten together with dairy. This applies even to a dvar charif such as leeks. Some say that one doesn't have to wait 6 hours after eating french fries fried in oil used for chicken or meat as long as the intention wasn't to have taste of the chicken or meat get into the fries. Others disagree. How Are Six Hours Calculated? Even according to the opinion that one only need to end the meal of meat in order eat dairy one shouldn't intentionally say Birkat Hamazon to complete the meal and then be permitted to eat dairy. If one is unsure whether 6 hours passed, some say that one should wait until 6 hours surely passed and some say that one may be lenient and certainly in a case where one only ate chicken and not meat. Sephardim are lenient. Someone sick who needs to eat milk within 6 hours may eat as long as he waited one hour said a bracha achrona on the meat, washed out one's mouth with a food and a drink, brushes one's teeth, and washes one's hands. If one forgot that one recently ate meat and now made a bracha on the dairy he should take a bite of the food so that it isn't a bracha livatala as long as one hour passed since one ate the meat. The pasuk in parshat Behalotcha says הַבָּשָׂר עוֹדֶנּוּ בֵּין שִׁנֵּיהֶם and according to Chazal this teaches us an interesting insight into Kashrut. The Gemara Chullin 105a infers from the pasuk that if one finds meat in one’s teeth it is still considered meat one’s teeth it is still considered meat and may not be eaten with milk. Practically, if a person finds a piece of meat between his teeth, before eating dairy he must remove it from his teeth. If a person swallows a piece of meat that was in one's mouth after one finished eating some poskim hold that one needs to restart the 6 hours. However, some poskim argue that one doesn't need to restart waiting. After one eats or drinks dairy one doesn't have to wait before eating meat. It is permitted to eat meat as long as one has washed one's hands, ate something that cleans one's teeth such as bread or fruit, and drank some liquid. If used silverware one doesn't have to wash one's hands but it is proper to do so since it is easy. The halacha is that one doesn't need to separate between a meal of dairy and meat with a bracha achrona. If one ate a tavshil of dairy one can eat meat afterwards as long as one washes out one's mouth. Some say that it is also necessary to wash out one's mouth with a liquid and a solid food. A tavshil of meat is a food that was cooked with meat but one isn't eating the actual meat such as a potato in a chullent. A tavshil of milk is a food that was cooked with cheese or milk but one isn't eating the actual cheese or milk. If one made a food with a sharp food in a dairy pot some say that one cannot eat it while one is waiting 6 hours. Others are lenient. If one finds cheese between one's teeth after some time some say that it isn't called cheese and one doesn't need to remove it if one wants to eat meat. However, most argue and hold that one must remove it. Ashkenazim hold that one should wait six hours after eating hard cheese before eating meat. Sephardim don't have this minhag and it is permitted to have meat after hard cheese as long as one washes out one's mouth and washes one's hands. Many poskim define hard cheese as anything that was hardened for six months. Accordingly, many poskim hold that mild cheddar, feta, mozzarella, and muenster cheeses are considered soft cheeses, however, medium, sharp and aged cheddar, and Parmesan cheeses are considered hard cheeses. However, some hold that any cheese that appears hard requires waiting six hours. Some poskim are lenient that one doesn't need to wait after eating hard cheese which was melted. ↑ Mateh Efraim by Rabbi Efraim Ardit p. 28b writes that when the Rambam says like 6 hours he means less than 6 hours. http://www.shtaygen.co.il/?CategoryID=1623&ArticleID=6477 cites the Kol Bo no. 106 s.v. veachar basar as quoting some who thought that shorter than 6 hours is also long enough if one cleans out one's teeth. See there. ↑ The Rabbenu Yerucham (Isur Ve'heter no. 39) writes that one can wait 3 or 4 hours, however, he contradicts himself in his book Toldot Adam Vechavah 15:5 where he writes that one should wait at least 6 hours. See further in an article on daf-yomi.com. Darkei Teshuva 89:6 quoting the Mizmor Ledovid defends the practice of 3 hours based on the fact that in some places in the winter there was only 3 hours time between the morning meal and dinner. The Darkei Teshuva quotes those who dismiss this practice. The Badei Hashulchan 89:35 writes that he didn't find a source for his minhag other than the Chaye Adam 127:10 who says that some are lenient to wait a few hours. ↑ Rama 89:1 writes that the minhag is to wait one hour. The Taz 89:2 explains that really this opinion is based on the Rabbenu Tam and Bahag that one doesn't have to wait any period of time; rather one simply needs to wash out one's mouth with liquids and solids, wash one's hands, and end the meal with a bracha achrona. ↑ Rama 89:1. Kitzur Shulchan Aruch 46:9 says one should wait 6 hours. Rama 89:1 writes that the minhag is to wait 1 hour but concludes that it’s appropriate to wait 6 hours. Shach 89:8 explains that anyone who has a sense of Torah should keep 6 hours. Mishneh Halachot 16:9 agrees and encourages everyone to keep 6 hours. The Biur HaGra explains that the source for the 1 hour minhag is based on the Zohar. Meiri (Chullin 105a) mentions that one should wait 6 hours or close to that. Sh”t Yabia Omer YD 1:4 explains that the hours weren’t precise because they didn’t have an exact way to keep track of time. ↑ Yam Shel Shlomo (Chullin 8:5) says that some have the minhag to wait 6 hours between meat dish and a milk dish. Badai Hashulchan 89:82 says one should be strict and that's the minhag. ↑ Rama YD 89:3. See Orchot Rabbenu p. 205 n. 11 who was strict upon himself not to even have nat bar nat within 6 hours. The case was that his wife served him tea in a dairy eino ben yomo cup after four or five hours after he ate meat and he didn't drink the tea even though it is permitted. Sefer Dvar Charif p. 11 fnt. 43 writes that no one is concerned for this stringency even though the Rivan holds that nat bar nat is treated like actual dairy if it was cooked. ↑ Rabbi Akiva Eiger 89:4 on Shach 89:19, Bet Meir 89 on Shach 89:19, and Sefer Dvar Charif p. 12 are lenient. See Sefer Dvar Charif p. 11 fnt. 44 quoting Rav Elyashiv is lenient against Pri Megadim that one can eat sharp food cooked in dairy pot within the 6 hours. ↑ Rav Schachter ("Basic Kitchen Kashrut" end of shiur) explained that one doesn't need to wait 6 hours after having french fries from a restaurant that fried them in the same deep fryer that was used to fry chicken. This is true if the cook didn't intend for the meat taste to be imparted into the french fries and just uses the same oil for convenience. In that case the fries aren't even considered tavshil basar. This ruling is based on the Rama YD 89:3, Shach YD 89:19, and Yad Yehuda 89. ↑ Horah Brurah 89:43 writes that the pot needs to be clean in order for the food to be considered parve and not meat. In the biurim he explains that for Sephardim the idea of the Shach doesn't follow from the Bet Yosef 173:1. Additionally, the Bet Meir 89 argues on the Shach since if the remnant foods are more than sixty certainly that's called a meat dish. See Voice of Lakewood (Feb 25 2011) which quotes a dispute between Rabbi Felder and Divrei Moshe whether the deep fried food which was fried in the same oil as meat or chicken was fried in requires the one eating the food to wait six hours. Rav Felder is strict since the Shach was only talking about a pot which was clean but there was a bit of meat remaining unintentionally. Also, teimat yisrael doesn't help since the taste of chicken or meat fat and vegetable oil is very similar. ↑ Kaf HaChaim 89:9 and Hilchot Baser BeChalav 1:8 based on the Dagul Mirvava 89:1 against the Aruch HaShulchan 89:4 who says to wait from the end of the meal (even not meat foods). Mishneh Halachot 5:97 and Divrei Shalom YD 24 agree with the Kaf Hachaim. ↑ The Rama 89:2 writes that it isn't right to intentionally complete a meat meal with intention of eating dairy immediately afterwards. But he notes that some aren't careful about that. Taz 89:3 strongly attacks such a minhag and says that it doesn't follow any opinion. Yet, the Pitchei Teshuva 89:2 cites the Bechor Shor who defends the minhag. ↑ Hilchot Baser BeChalav 1:20. Badei Hashulchan 89:9 writes that someone who is lenient doesn't lose anything. Mishneh Halachot 5:97:3 writes that initially one should be strict to wait a complete 6 hours. ↑ Yalkut Yosef Isur Vheter v. 3 p. 386 explains that it isn't considered a dvar sheyesh lo matirin since it is possible to have dairy now and later. It is comparable to the Tzlach Pesachim 9b that with respect to moving muktzeh there's no dvar sheyesh lo matirin. He cites the Zer Hashulchan 89:29 who is strict and says that it isn't comparable to the Tzlach since one isn't going to eat that piece of cheese twice. He also points out that Rabbi Akiva Eiger Megillah 5b seems to disagree with the Tzlach. Regarding the application of the Tzlach see Taharat Habayit v. 3 p. 268 who quotes the Pri Hasadeh 2:38 and Maharam (Daat Torah YD 199) who limit the Nodeh Beyehuda YD 53 to say that it would not be considered a dvar sheyesh lo matirin for a woman to go back to mikveh if she had to wait an entire night. Similarly, Nodeh Beyehuda EH 2:38 applies his own concept to a woman be able to get married within 24 months if there's a doubt if she was pregnant from a Jew or non-Jew since she could be married now and later and it isn't considered a dvar sheyesh lo matirin to wait. ↑ Badei Hashulchan 89:36, Shoel Vnishal YD 2:26. He adds that if it is hard to wait even one hour it is permitted to eat even within one hour as one as long washes one's mouth with a food and a drink, brushes one's teeth, and washes one's hands. ↑ The Tur YD 89 says that according to Rashi if one finds meat between one’s teeth before eating dairy one must remove the piece of meat, while according to the Rambam once 6 hours has passed the meat has become digested and lost its status of meat. Shulchan Aruch YD 89:1 rules that even after 6 hours has passed and one finds meat between one’s teeth one must remove it. ↑ Badei Hashulchan 88:13 cites the Haflah 89:1 who writes that if one swallows the piece of meat found in one's mouth after a few hours that would require restarting waiting 6 hours. However, he notes that the minhag isn't like that. Yalkut Yosef Isur Vheter v. 3 p. 373 implies that one can't eat that piece of meat. ↑ Rav Belsky in Shulchan Halevi 22:2 p. 208 writes that a small piece of food stuck in one's mouth after some time doesn't have any taste and doesn't require restarting. He didn't want to establish at what point this would be the case. Or Hahalacha by Rav Makis (Halacha Bahira 88:1) is lenient since there's no taste in a small piece stuck in one's mouth and chazal said to wait after finishing eating and were not concerned with small crumbs which commonly are left in one's mouth. Hari Yehuda YD 1:10 at great length shows that one doesn't need to restart the clock. One reason is that according to Rashi that we're concerned about taste it should be permitted in this case since the food in one's mouth begins to break down and that combines with the digestion of the stomach. Horah Brurah 88:9 is lenient. Horah Brurah cites Rav Elyashiv (Agadalcha Bshulchan p. 29) and Rav Nevinsal (Gam Ani Odecha 2:138) who are also lenient. ↑ The Pri Chadash 89:6 (cited by Bear Heitiv 89:5) holds that one doesn't have to wash one's hands if one ate with a fork. Pri Megadim Siftei Daat 89:20 adds that it is proper to be strict since it is easy to do so. ↑ Even though the Shlah and Zohar are strict, the Rama OC 494:3 and Mishna Brurah 494:16 don't require a bracha achrona after dairy before eating meat. Pri Megadim M"Z 89:3 writes that it is a chumra and even if one is strict it is sufficient to make a bracha achrona even if one's intention is to eat meat afterwards. ↑ Badei Hashulchan 89:83 writes that one needs to be strict to require cleaning out one's mouth with a liquid and a solid just like between eating cheese and meat. However, he cites the Chagurat Shmuel and Aruch Hashulchan who hold that it isn't necessary. ↑ Pri Megadim E"A 494:6 writes that since a sharp food is treated like the actual food itself if it is cooked in a dairy pot one shouldn't eat it within 6 hours. However, see Rabbi Akiva Eiger YD 89:4 who is lenient to allow not waiting 6 hours after eating a sharp food cooked in a meat pot. Sefer Dvar Charif p. 11 fnt. 45 quotes from the Sefer Knesset Chachmei Yisrael who says that in theory it is possible to distinguish between the Pri Megadim and Rabbi Akiva Eiger. Only to initiate the process of waiting 6 hours do we say that a sharp food isn't considered like the dairy itself but once one has to wait from eating real meat perhaps everyone would agree to disallow eating a sharp food cooked in a diary pot. He quotes Rav Elyashiv was being lenient against the Pri Megadim. ↑ Isur Veheter 40:10 holds that only meat stuck in one's teeth is considered meat but not cheese. Taz 89:4 cites this. However, the Yad Yehuda Pirush Haaruch 89:4 points out that the Rashba Torat Habayit 3:4 86a disagrees. Aruch Hashulchan 89:11 also holds that cheese in one's teeth is like cheese. ↑ Teshuvat Maharam Rotenburg cited by Bet Yosef OC 173, Rama YD 89:2. Taz 89:4 explains that the two reasons for waiting between meat and milk is because of meat getting stuck in your teeth and the taste remaining in your mouth. The only reason that applies to waiting after having hard cheese is because of the lingering taste. Pri Chadash 89:16 argues on the Taz that reason of the food getting stuck in your teeth also applies to cheese. Aruch Hashulchan 89:11 agrees. Darkei Teshuva 89:2 quotes the Arizal who wouldn't eat meat for the rest of the day after having eaten hard cheese. ↑ Yalkut Yosef YD 89:46 writes that it is permitted according to the strict halacha for Sephardim not to wait to have meat after having hard cheese as long as one washes out one's mouth and washes one's hands. Horah Brurah 89:34 writes that the Sephardic minhag is not to be concerned for hard cheeses. ↑ Isur Veheter 40:10, Shach 89:15, Taz 89:4, Pri Chadash 89:16, Aruch Hashulchan 89:11, and Kitzur Shulchan Aruch 46:11 write that hard cheese is cheese that was aged for 6 months. ↑ Rabbi Avrohom Gordimer in OU's Daf HaKashrus Tamuz 5771 p. 55. ↑ Shevet Halevi 2:35 writes that one should be strict about any hard cheese even if it is aged for less than 6 months. Rav Elyashiv in Kovetz Teshuvot 1:58:2 writes that one should wait six hours after eating melted yellow cheese on pizza since the reason to wait for cheese is the sharp taste and that's true even if it melted. ↑ Yad Yehuda Pirush Hakatzar 89:30 writes that if the cheese was softened by being melted one doesn't have to be strict to consider the food a tavshil of cheese. See OU Article fnt. 6 which says that the OU holds that the Yad Yehuda can only be applied to a case of a tavshil of cheese in that the cheese isn't noticeable. However, some apply the Yad Yehuda to any melted cheese. Badei Hashulchan 89:2 s.v. vechen seems to apply the Yad Yehuda to all cases but questions it since the softening only helps that it doesn't get stuck in one's teeth but not for the sharp taste. ↑ Pischei Teshuva ad loc.